“An Al-Qaeda suicide bomber detonated his explosives belt during a mourning ceremony organised by the Popular Resistance Committees,” a local militia that fought alongside the army, said provincial governor Jamal al-Aqal. “Bodies were flying in all directions because the explosion was so powerful,” a witness said. Later on Sunday, Jamila told AFP that “three of the wounded have succumbed to their wounds,” raising the overall death toll to 45. The deputy head of Jaar’s municipal authority held the government at least partially responsible for the attack because of its slowness in deploying police to the town after its recapture by the army. “There is no presence of police in Jaar and other towns of Abyan, while Al-Qaeda militants remain underground,” said Nasser Abdullah Mansari. “A drone fired two missiles at an all-terrain vehicle… killing its five occupants, all members of Al-Qaeda,” a local official said, requesting anonymity. Al-Qaeda had taken advantage of a nearly year-long uprising against Hadi’s predecessor, veteran strongman Ali Abdullah Saleh, to seize large swathes of the south and east. 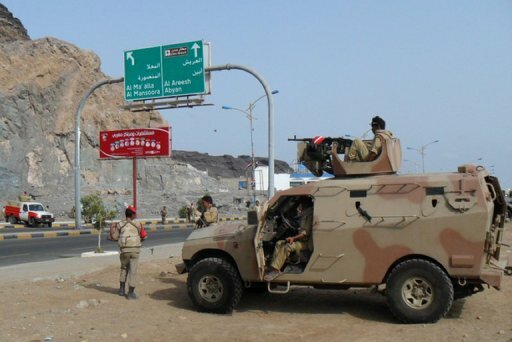 In July, Yemen announced it had placed its security services on high alert to prevent “terrorist” attacks after it uncovered a plot to launch assaults against security and military checkpoints.